John Herschel Glenn Jr. (July 18, 1921 – December 8, 2016) was a former astronaut and United States Senator. He is best known for being the first American to orbit the Earth as an astronaut for NASA. After his career as an astronaut, he went into politics and served as a Senator from his home state of Ohio from 1974-1999. In 1998, he made his second spaceflight at the age of 77 years. He is the oldest man ever in outer space. Following the death of senator Edward Brooke in January 2015, he was the oldest living former U.S. senator until his death in December 2016. Glenn was born in Cambridge, Ohio, to John Glenn, Sr. and Teresa (née Sproat). He was raised in New Concord, Ohio. Glenn studied engineering at Muskingum College. He received his private pilot's license for physics course credit in 1941. He received a Bachelor of Science at Muskingum College in 1942. Glenn joined the United States Navy in 1942 and became a pilot. He switched to the United States Marine Corps soon afterwards. He served as a pilot in World War II and flew missions over the Pacific Ocean. Glenn stayed in the Marines after the war. In the Korean War, he shot down three enemy planes and flew in 63 combat missions. On July 16, 1957, then-Major Glenn set the transcontinental air speed record, flying a F8U-1 Crusader from NAS Los Alamitos to Floyd Bennett Field, Brooklyn, in 3 hours, 23 minutes, and 8.4 seconds. Project Bullet, as the mission was called, provided both the first transcontinental flight to average supersonic speed, and the first continuous transcontinental panoramic photograph of the United States. Glenn was awarded his fifth Distinguished Flying Cross for the mission. In 1958, Glenn joined Project Mercury. He was the oldest of the seven pilots selected. Although Alan Shepard and Gus Grissom flew in outer space before Glenn did, Glenn was the first American to orbit the earth, as neither of the previous two had made a full orbit. He flew a Mercury spacecraft called Friendship 7. His first words when reaching orbit were "Zero G and I feel fine." He retired from NASA and the military after his flight. He went into business. He became an executive for Royal Crown Cola. Glenn was friends with Robert F. Kennedy. Kennedy, an Attorney General of the United States and US Senator, told Glenn he should run for office. He planned on running for Senate in 1964, but an accident at home made him decide not to. In 1974, he ran for Senate as a Democrat. He defeated Senator Howard Metzenbaum in the primary. Glenn later beat Ralph J. Perk in the general election. He was reelected to the Senate in 1980. In 1984, he ran for President but the Democratic nomination went to Walter Mondale. Glenn was a popular senator and was reelected several more times. On April 6, 1943, Glenn married his childhood sweetheart, Anna Margaret Castor. They had met in New Concord and played together in the school band. They were the parents of two children. Glenn lived in Columbus, Ohio with his wife. On December 8, 2016, Glenn died at a medical center after suffering from a "serious medical condition" in Columbus. He was 95 years old. His body was buried at Arlington National Cemetery on April 6, 2017. ↑ "John Glenn, American hero, aviation icon and former U.S. senator, dies at 95". The Columbus Dispatch. Retrieved December 8, 2016. ↑ "John Glenn, First American to Orbit the Earth, Dies". ABC News. United States: ABC. December 8, 2016. Retrieved December 8, 2016. ↑ Dresbach, Jim (December 22, 2016). 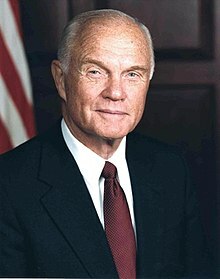 "John Glenn to be buried at ANC in April". The Pentagram. Retrieved March 27, 2017. This page was last changed on 28 March 2019, at 16:39.